Ruby just finished week two on Technyflex by New Zealand’s Best. As mentioned in our first post, I was recently contacted by Melissa Burrus, the owner of New Zealand’s Best, the U.S. distributor of Technyflex, a natural joint care supplement for dogs, cats, and horses. Melissa asked if Ruby would like to try Technyflex and share the results with her readers. Ruby does experience some occasional stiffness, especially in the morning and when the temperature drops, so we agreed. Ruby definitely seems to be feeling great. These pictures (and short video) were taken last Saturday, the first real cold day of the year and as you can see, she’s feeling perky. We will give a final, more detailed update on our experience with Technyflex on December 14th, but so far we are very pleased with the results. If you would like to try Technyflex, please use code PIP15 for 15% off your order. 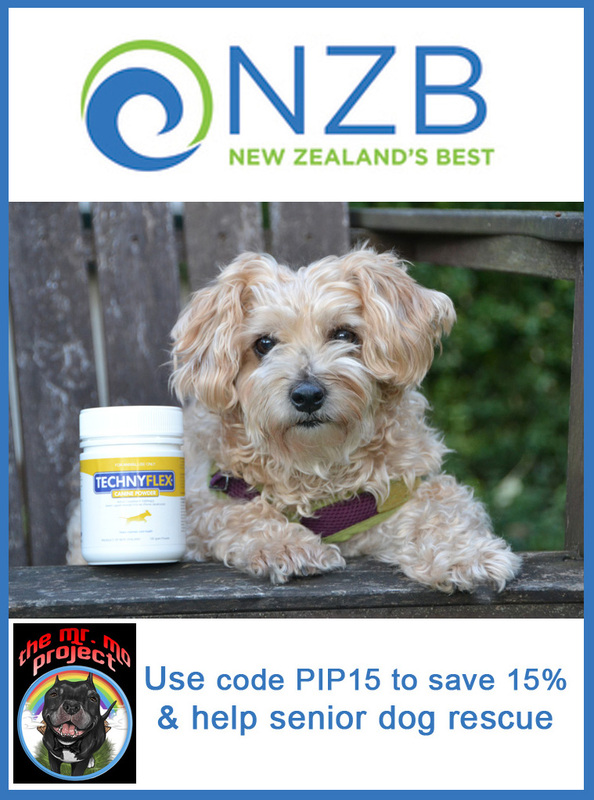 And don’t forget that New Zealand’s Best is donating part of all sales to The Mr. Moe Project in honor of Adopt-A-Senior Dog Month. Tune in Friday for the start of our Holidays, Hounds and Hot Buys Gift Guide and Giveaway. Ruby is wearing her new Sierra Dog Coat by Teckelklub, one of the amazing brands participating in #houndsandholidays giveaway! This post is sponsored by New Zealand’s Best. I am being compensated for helping spread the word about New Zealand’s Best but I only share information that is relevant to my readers. New Zealand’s Best is not responsible for the content of this article. Looks like you've got it all under control, Ruby! I do believe we will have to give this one a try! We are always looking for new things to try for joints…especially with two senior dogs! Great review…thanks! You are moving great, Ruby, and we love your coat! I'm so glad these are working so well for you, Ruby. I just loved seeing you have such fun in your video. You sure can run, can't you?!? I bet these supplements would have worked well for my angel pup Shellie and my angel Rosie. Thank you for sharing this with us! And we can't wait for the holiday gift guide! You are looking energized. Pretty coat you are wearing too! Ruby, it sure looks like you are feeling like a young dog again. That is great news. That stuff works pretty darn good. You all have a wonderful Thanksgiving. We are just learning about this company and I'm so glad their supplements seem to be helping! I look forward to hearing your other updates later on. Lots of great products seem to be from New Zealand! It's always a good feeling when our dogs do well. Good to see that Ruby is doing so much better. You are looking terrific and full of energy pretty Ruby! Glad she's feeling great. What an adorable video. Love her little tail wagging! Sounds like a great product – we'll have to check it out! Looks like Ruby has a "pep in her step" of a young puppy. Looking and feeling fantastic Ruby! Must be all that good loving you keep getting that is making the difference. (plus the supplement) lol Have a Happy Thanksgiving! At 10 years young, Magic does need some joint support. So glad there are more options available now than in the past. I will absolutely ask my vet about using this for our Lyla. Ruby looks like a spry young pup! Glad it is working….hope it continues. Great to see Ruby romping around so happily! We're glad to see you moving good, Ruby! Look at you go, Ruby! You look adorable. We're so glad you're feeling great. You go, Ruby!! Hopefully this continues to work for you. We will check in again on the 14th… Gracie tried something that the vet had given her but I noticed no change. Thanks for sharing your (so-far) success. Have a Happy Thanksgiving! Ruby looks great — so happy and healthy! Glad this product is working it's magic! Great review! Love your jacket. Always good to know about another good joint supplement! Looking good!!! I'll look into this! It's great to hear she's showing improvement! How old is Ruby? Wow! Look at Ruby go! It looks like your supplement is working well. Way to go. So glad to hear you are happy with it and that it's working. I'll have to check it out. Thanks for sharing Ruby's trial with it! And I love that they donate to help senior dogs. That's pretty (p)awesome! Awesome that Ruby is feeling great…looking great too! Ruby sure has pep in her step even on the cold day. Hopefully it will work well and also lead to lots of donations. Love the Win Win for seniors. Looking good Ruby! Would love to try this stuff out on my 3 seniors!